Now that you've created a Facebook page for your business, you need to grow your fan base. Before getting started, however, know what your goals are. What do you want the fan page to accomplish for your business? Collecting a large number of fans is great, but you have to decide whether you're happy with exposure alone, or whether you want fans to become customers. Do you want your Facebook page to help you sell more products and services? Having a lot of fans may not increase sales immediately, but it should at least increase the strength of your brand through reputation management, improved customer support, and the conversion of fans into advocates. Over time those tactics can grow sales. Your initial goal, however, should be to expand your reach, provide relevant information about your business, influence potential customers, demonstrate that you have authority in your field, and engage fans. Get started by attracting fans. Facebook pages have a feature that allows you to invite contacts to become fans of your new business page. Go to Edit Page, click Resources on the left, and then select Tell Your Fans. Invite friends and contacts to become your Facebook fans. Some contacts will become fans of your page, while others will ignore the request. It's best to send the request only once; otherwise, you risk annoying potential fans. You can, however, offer an incentive or a reward for becoming a fan, which I'll discuss later. Other methods of giving people the opportunity to find out about your Facebook page include embedding a link in your email signature; adding information about it on your business cards, website, and marketing materials; and posting a sign in your office. After you start to grow your Facebook fan base, you can target a specific demographic. This may be the group most likely to become your fans--or you might want to focus on growing your customer base in other ways. I'll discuss this topic further when I look at Facebook Insights (see the next page). Add a Facebook 'Like' box. Start on this page to select a username. Note that once you set this name, you can change it only once, and you can't transfer it to another page--so, before you start, confirm that you're logged in and using your Facebook page under your business name rather than your personal name. Taking this step will prevent your accidentally assigning your business page name to your personal Facebook page. Also, check Facebook's guidelines for what kinds of usernames you can use; your first choice may already be taken. Facebook allows five types of updates. 1. Information about your business: You can post information about specials, sales, recent news, and other items of interest. If you have a blog, you can also add links to your blog posts. I'll discuss later how to automate this process. 2. Links to other sites: Other websites may have news and articles that interest your customers. I frequently posts links to other sites that have new content pertinent to my business. 3. Questions: Your fans want to belong to a community. Asking them questions about your products and services, as well as items that they would like to see, helps to engage your fans, which will in turn increase their loyalty to your brand. 4. Personal updates: By "personal," I don't mean that you should tell customers about your family or home life. Rather, add a distinctive touch that makes people see that a real person is behind the business. This step can be as simple as putting up a Friday post to ask what their plans are for the weekend. 5. Responses to questions: Fans will post questions about your products and services, and they may even leave complaints. This is an opportunity to provide excellent customer service. I don't ever recommend ignoring customer inquiries. 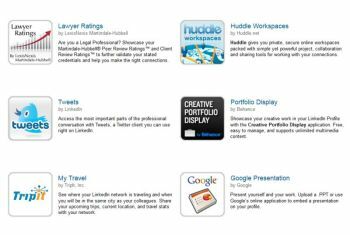 LinkedIn applications include one for Twitter, which you can link with Facebook. Try integrating Google+, Linkedin, and Twitter with your Facebook page. Automating this integration can make it easier to manage updates, but it can also take the "social" aspect out of social media. Of course, manual posts offer a personal touch but consume more time, so prioritize. Google+: Currently you can integrate a personal profile on Facebook so that your wall posts show up in Google+, but you cannot perform this procedure from a Facebook page. If you want to integrate the two, you will need to add a Google+ tab to your Facebook page. Go to the Facebook application and then to Google Plus Tab for Pages, and add the application to your page. LinkedIn: You can't post directly from Facebook to LinkedIn, but you can send your Twitter material to LinkedIn. That way, if you've set up Facebook to post to Twitter, your Facebook content will also appear on LinkedIn. In your LinkedIn profile, click Add an Application and then select Tweets. Twitter: To integrate Facebook with Twitter, go to this Facebook page. You'll have control over the type of Facebook posts that are shared with Twitter. 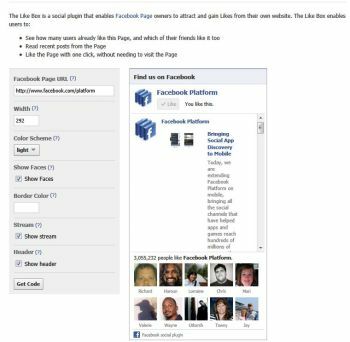 Blog posts: You can integrate your blog posts with Facebook via RSS feed by using a Facebook application such as Networked Blogs. Within Networked Blogs, log in with your Facebook account, register your blog, and complete the sign-up process. You can set up blog posts to appear on your Facebook wall automatically; alternatively, you can choose to set up the feed and then post selected articles manually.